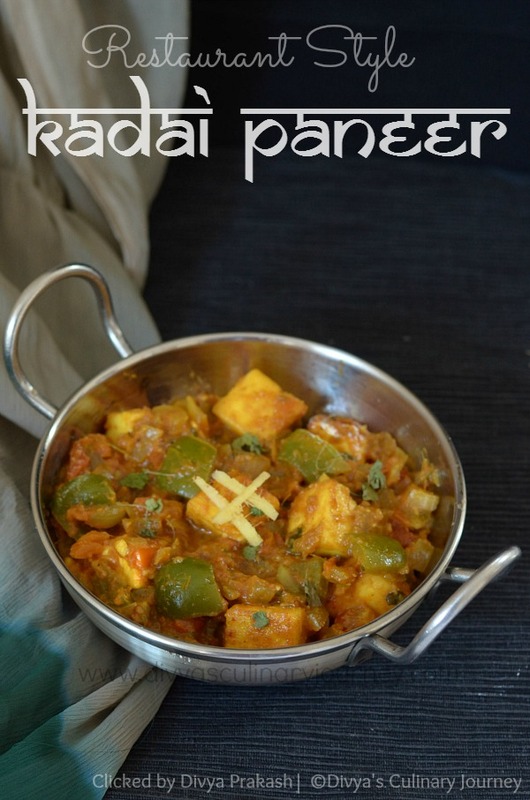 I am going to share Kadai Paneer recipe today. 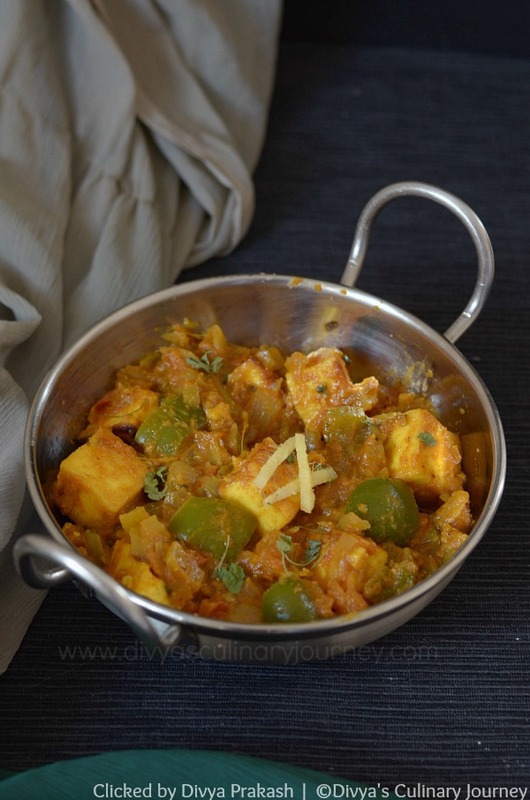 It is a easy to make dish using paneer, in a spicy tomato sauce, cooked in a Kadai (Wok). It is also known as karahi paneer or kadhai paneer. There are different versions of this dish - dry, semi-gravy or gravy too. This depends on the consistency you prefer. My daughter is a big fan of paneer and I make different varieties of panneer dishes for her. Even the little one has started to like paneer so much that they finish their food faster when paneer is served. So I will be sharing more paneer recipes that I try for them here in my blog. Coming to today's Kadai paneer recipe - It is a very easy to make dish and it can be served with roti/ chappathi or even with mild pulao. Dice Paneer and capsicum into bite sized cubes. Puree one tomato along with ginger garlic. Chop onions and rest of the tomatoes. 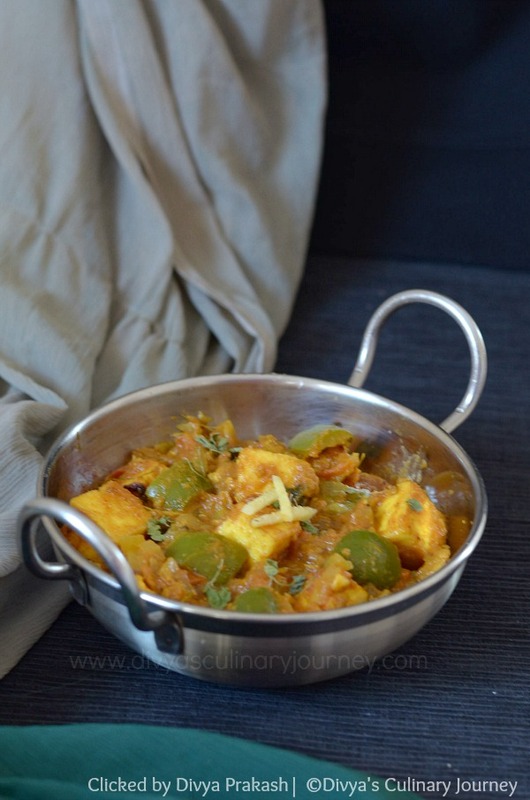 How to prepare Kadai paneer? Heat a tablespoon of oil, fry paneer cubes still they are slightly golden and remove it from the pan and keep it aside. In the same pan, fry capsicum cubes and take them out and keep it aside. Now add the remaining 1 Tablespoon of oil to the same pan, fry cumin seeds, then add onions and fry till they are translucent. Then add the chopped tomatoes and ground tomato mixture and cook for 2-3 minutes. Then add the garam masala powder, turmeric powder, coriander powder and chilli powder and cook for another couple of minutes. Add about half a cup of water along with salt and cook for another 2-3 minutes. To this add the paneer cubes and capsicum and cover and cook for another 2 minutes. Add crushed kasuri methi leaves and cook for another 1 minute and turn off the heat. I have pureed only one tomato and the rest of tomatoes -chopped them finely and used. You can puree all of them or chop them finely and use too. Instead of grinding fresh ginger and garlic, you can use ginger-garlic paste too if it was readily available. Paneer recipe is my favourite too, looks yummy dear! I'd love to learn how to cook paneer at home!